We recently completed the first round of training for the new staff at the Defence and National Rehabilitation Centre (DNRC) at Stanford Hall, Loughborough. 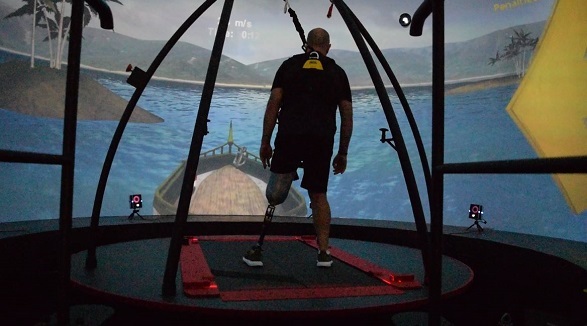 The team will be using Motek‘s High End Computer Assisted Rehabilitation Environment (CAREN) to rehabilitate military veterans and active soldiers for a wide range of neurological conditions, amputees, spinal injuries, etc. We were pleased to welcome Mike Jones, UK C-Mill ambassador and client at The Morrello Clinic, who we invited to try out the CAREN High End during the training. The CAREN’s new staff at the DNRC were able to learn how to use the equipment using Mike as their subject, exploring the numerous virtual reality programmes and how the system’s wide range of movement and applications could challenge and benefit patients such as Mike, who is a lower leg amputee. Here we can see Mike on the ‘Rope Bridge’ application. 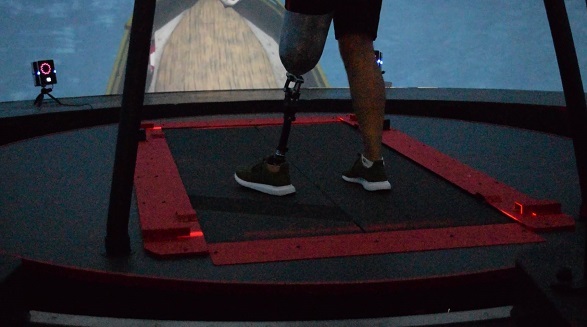 The CAREN’s motion base challenges Mike using a range of movement, and as Mike walks up and down the bridge, the treadmill tilts to match the environment he is immersed in. Perturbations add an extra challenge, where the platform quickly shakes from side-to-side at certain points to knock Mike off balance, mimicking a side wind. This is great balance and gait training for patients to safely learn how to recover from an unexpected change in movement. In this video, Mike has been set the challenge of steering a boat around targets. Mike steers the boat by moving around on the treadmill, which is picked up by the motion capture system. The force plate technology also captures and analyses his footsteps. You can see that the CAREN’s motion base moves according to the movement of the boat, creating an unstable surface for Mike. Here you can see the full application for Sailing Ships, where Mike steers the ships around the targets by moving around on the static treadmill. Again, the CAREN’s motion base moves according to the movement of the boat and the waves, and Mike needs to move all around the treadmill to get the boat through the targets. In this video, Mike has been challenged to step over approaching obstacles and collect extra points to achieve a high score. 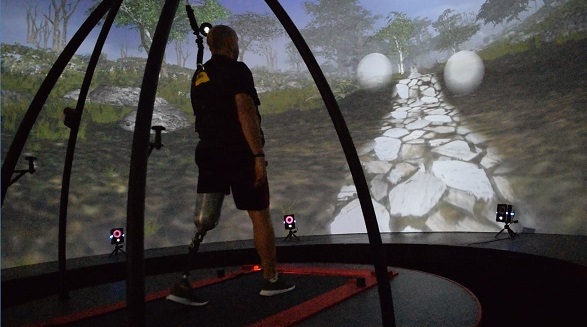 Motek’s ‘Microbes’ application is a fantastic way to train gait adaptability, and you can see how Mike is immersed in the CAREN High End’s 360 degrees virtual world as he progresses through the game. Here we can see Mike multi-tasking to collect pizza ingredients. 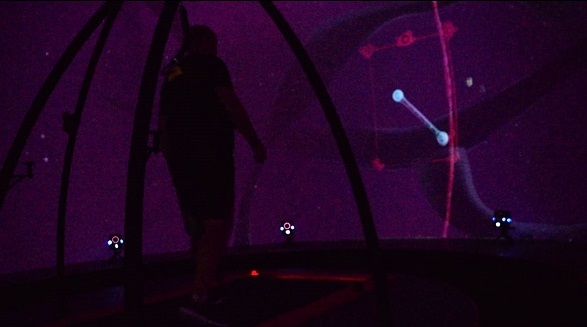 Mike’s movements control the cart, swinging it from left to right. He has to walk from side to side across the treadmill to avoid obstacles and collect the various ingredients, racking up points as he goes along. Here, Mike walks along a path interspersed with hills. Motion capture markers on Mike’s hands track his movements as he swats away incoming birds and insects, adding an extra multi-tasking challenge as the CAREN motion base tilts up and down. Ever wondered how far the CAREN could push a patient? In this video, Richard Allan from the DNRC progresses through one of the more advanced levels of The Road application. You can see how the motion base dramatically tips up and down as Richard speeds over hills along the road. 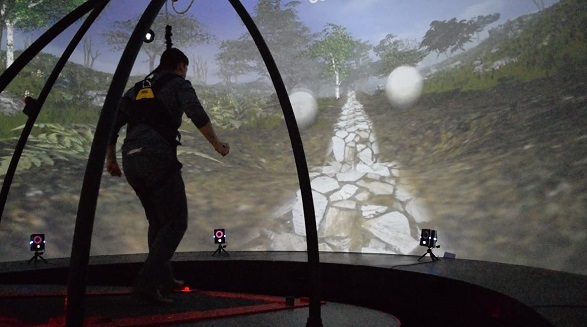 This is a nice example of how the CAREN can benefit a huge range of patients, whether they are learning to walk again or ready to start running. 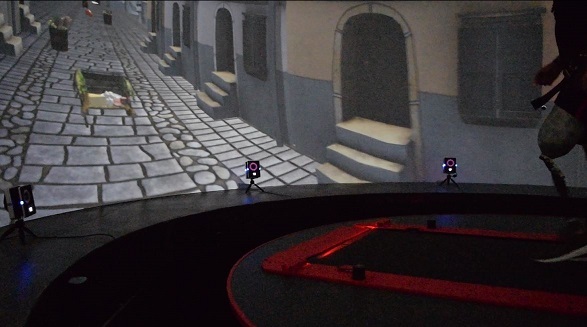 Here you can see the real time feedback between the movement of the stick, the motion capture and the movement of the CAREN’s motion base. Every time the stick is moved, the base moves accordingly. 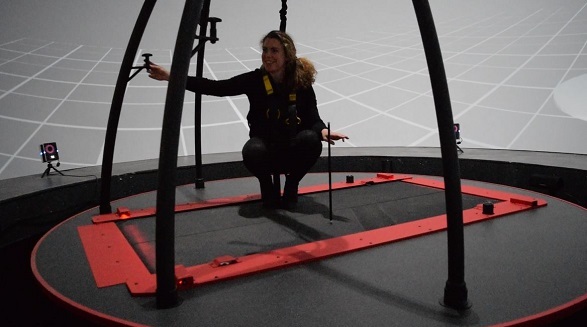 This demonstrates the feedback between the motion capture sensors and the six-degrees-of-freedom motion base.